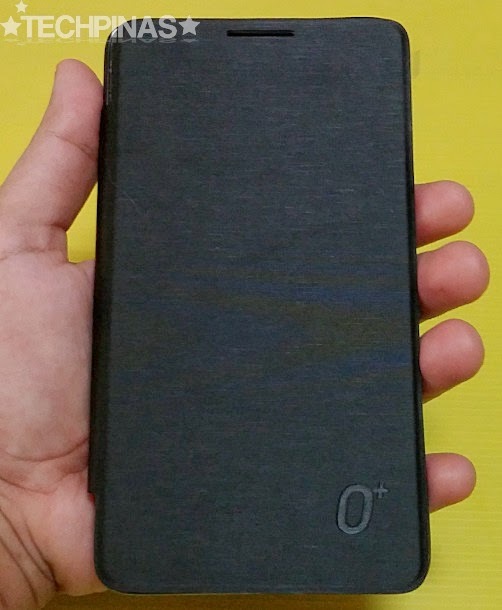 TP Friends, this is how the American company's freshly released O+ Fab Go Android phablet - which I introduced to you last week - looks in the flesh. 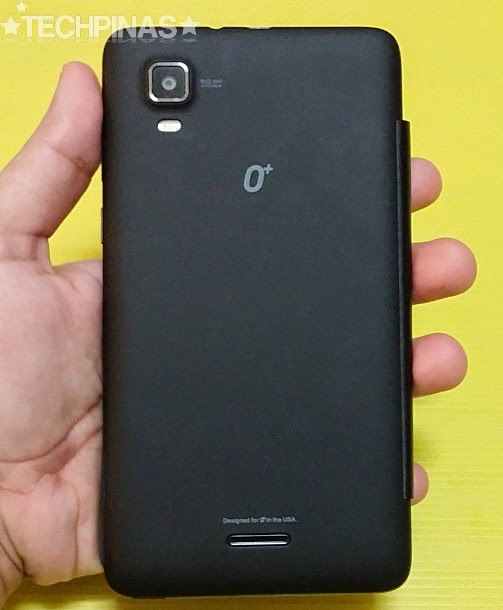 O+ Fab Go sports a massive 6-inch FWVGA TFT capacitive touchscreen (practically making it a smartphone and tablet in one), a 5 MegaPixel autofocus camera with LED flash at the back, a 2 MegaPixel front-facing cam, and a removable 2,500 mAh Li-Ion battery pack delivering around 12 to 13 hours of uptime with mixed usage. 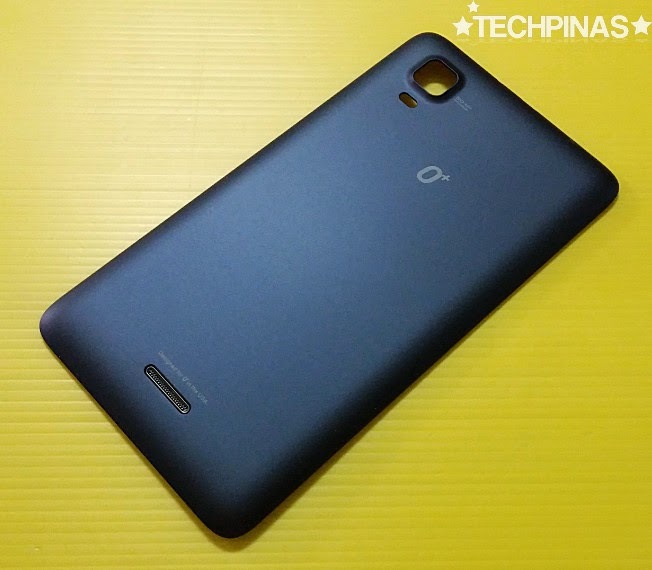 Inside the shell, the Dual SIM Dual 3G Standby O+ Fab Go runs Android 4.2.2 Jelly Bean operating system sans any custom skin (but featuring O+ customized icons) with its 1.3 GHz Dual Core ARM Cortex A7 CPU and 500 MHz Mali-400 MP1 GPU based MediaTek MT6572 SoC, handles multitasking with 1 GB of RAM and has 4 GB of ROM that users can easily expand via microSD card slot supporting up to 32 GB. 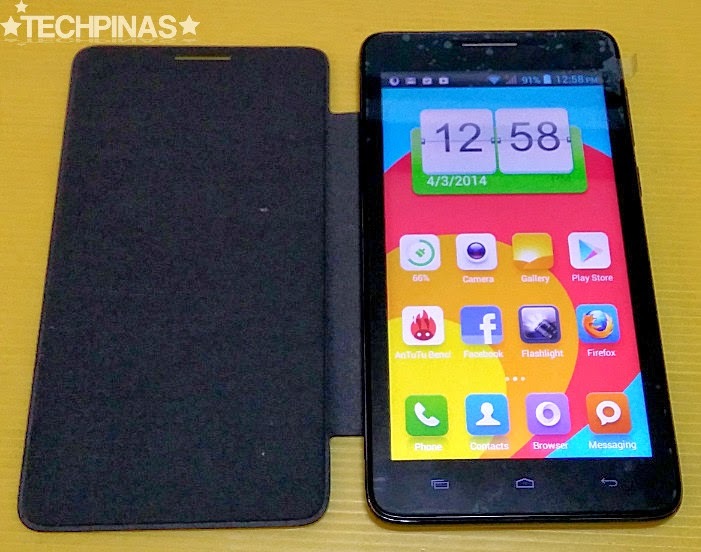 In terms of connectivity, the handset supports WiFi, Bluetooth, and 3G HSPA+. 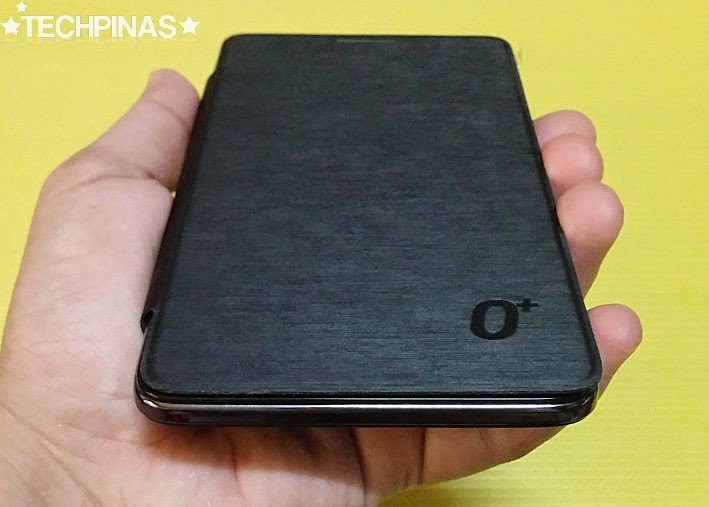 It's now available nationwide at all O+ Kiosks and Concept Stores for only Php 8,999 and for that amount you already get this free executive flip cover, which automatically turns on and turns off the display using the phone's proximity sensor. I've been playing with the device for a week now and off hand, I'm thoroughly impressed with how gorgeous and elegant it looks. If you're a yuppie or a corporate user, this is a handset you won't be shy to put on the table during round-table meetings. And it also doesn't hurt that it gives you this feel of durability when you hold it. As I've shared before, O+ takes pride in doing stress tests on their devices before releasing them to make sure that they can take the knocks and bumps of daily use. O+ devices, I would say, are really made to last. Check out the sleek brushed texture of the cover. Also, notice the heat-pressed O+ logo on the lower right corner of the face. 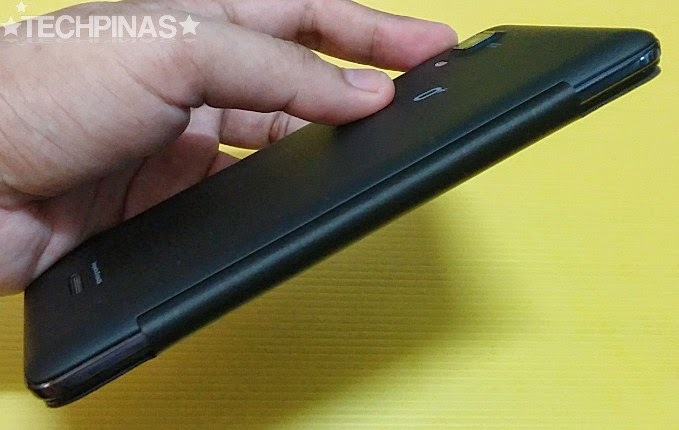 There's a hole near the top of the cover for the phone's earpiece so you can still make calls even if its on top of O+ Fab Go's display. 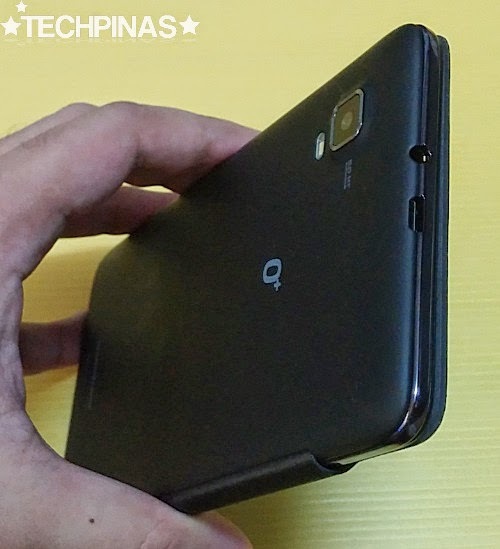 At the back, we'll find the phablet's 5 MegaPixel autofocus camera with LED flash and, near the rear, we'll see Fab Go's loud speaker, which delivers clear and crisp sound quality. Framing the sides of the phone is this faux metal chrome accent that really gives the device an air of corporate sophistication. 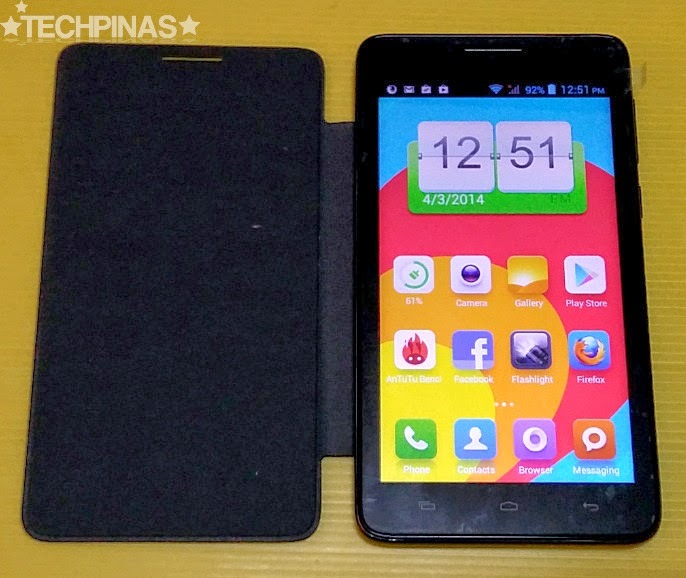 I'm using MIUI skin which I downloaded for free from Google Play Store. It's my favorite custom interface currently. 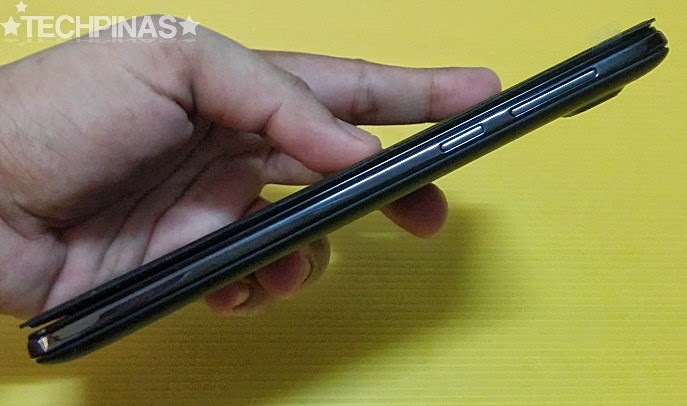 The handset only runs on a dual core processor but I find that it's already enough to give a smooth and stutter-free touch and gaming experience to the user. 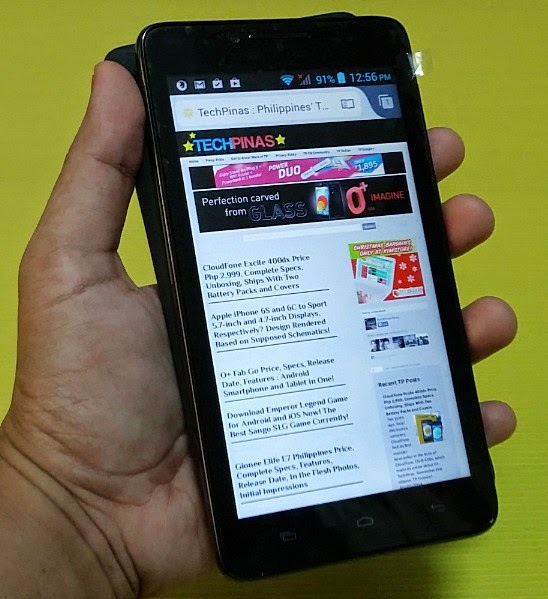 The device flawlessly runs all the top 10 free games on Google Play Store currently, including Candy Crush Saga, Temple Run 2, Subway Surfers, Zombie Tsunami, and Hill-Climb Racing. TP Friends, this how O+ Fab Go's retail package looks. 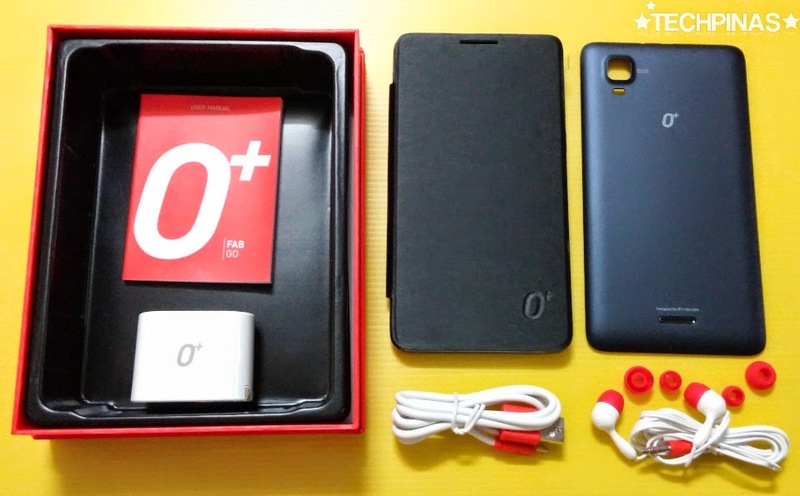 Inside the box, the unit is joined by the user manual, charger, microUSB to USB connector cable, earphones, free flip cover, and an additional plain plastic back cover with matte finish. 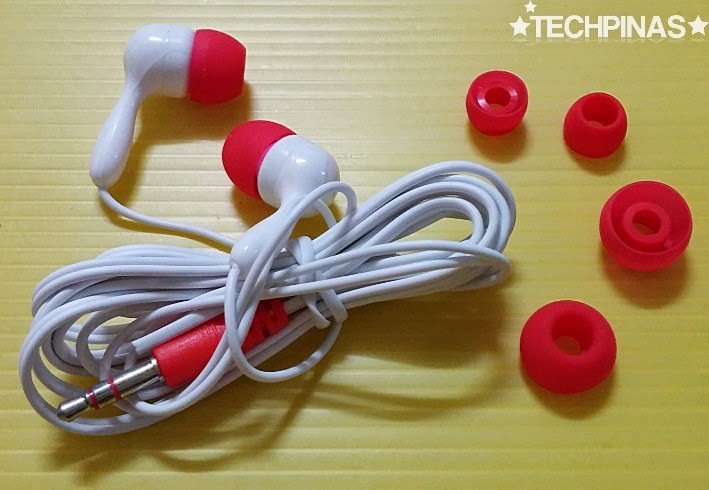 The earphones have in-ear noise-cancelling silicon buds -- and you get two extra pairs in small and large sizes. It's all in the details! 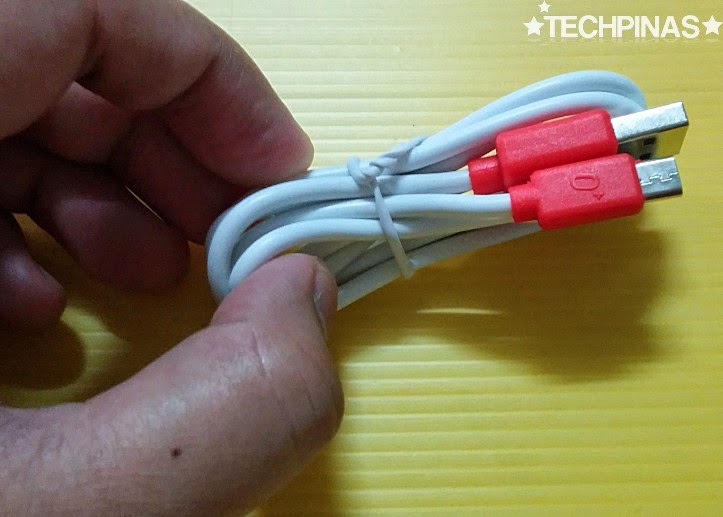 See that embossed O+ logo on the microUSB cable connector? The charger has retractable prongs making it easier to keep in the pocket should you want to bring it with you anywhere you go. 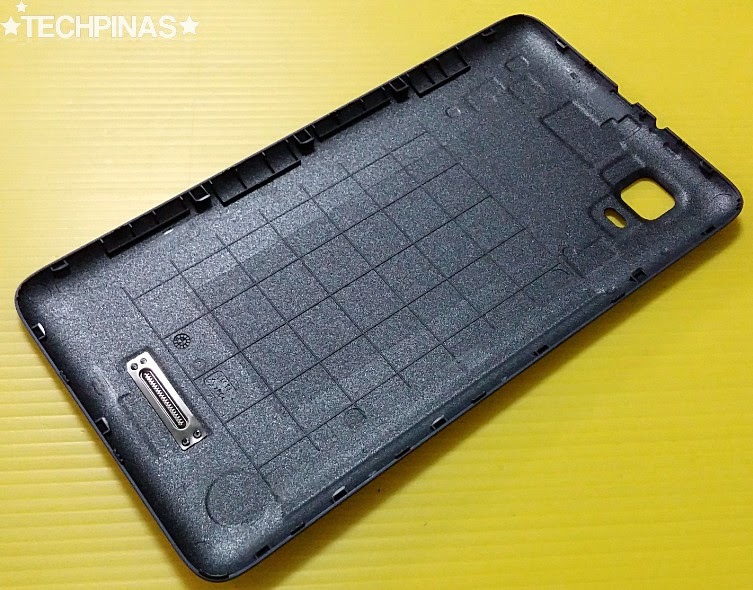 You may opt to use this back cover in lieu of the flip case if you're not fond of always having to close and open the lid when using your O+ Fab Go. All O+ devices are meticulously crafted. I mean, check out the inside part of O+ Fab Go's swappable back cover. 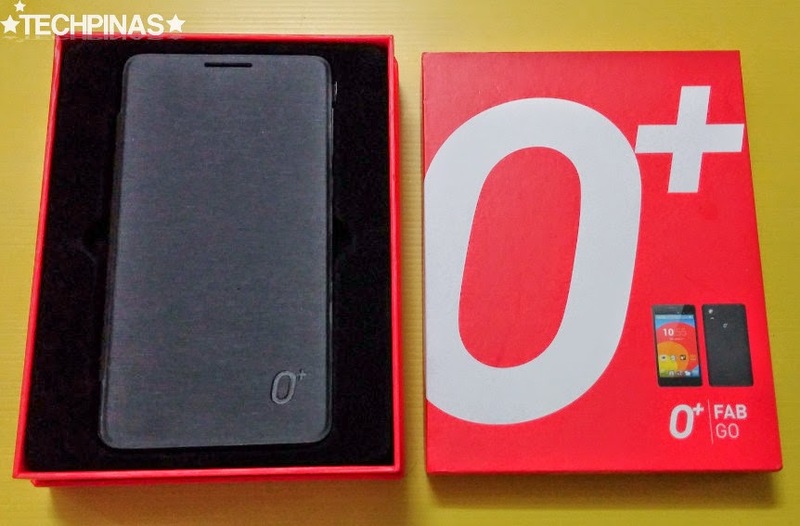 At the bottom of the box, O+ printed all the key features of the phablet. 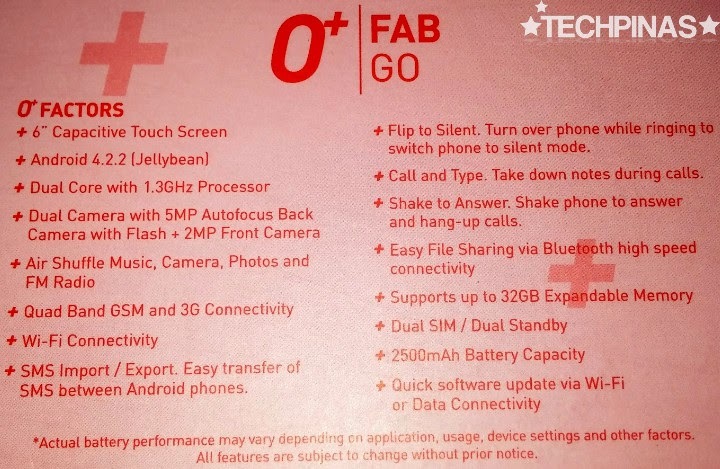 As I've explained in a previous post, just like any other smartphone from the American company, the Fab Go comes with unique and exciting software features including Air Shuffle technology that permits a touch-less mobile experience when taking photos, browsing images, listening to FM radio, and playing music tracks. Users will also get Over-The-Air (OTA) software update, Disc Jockey Feature, Shake To Change Music, Flip to Silent Calls and Alarms, and Shake to Answer or Drop Phone Calls. 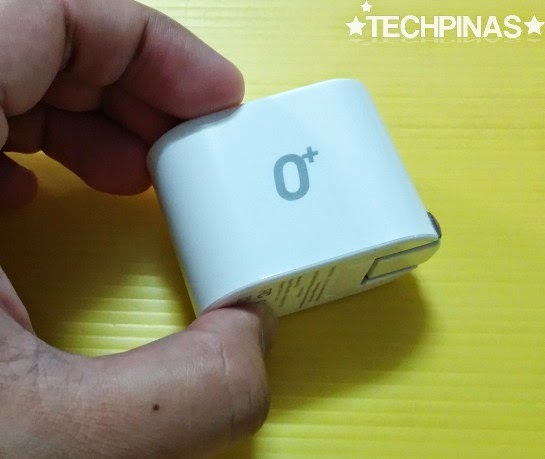 TP Friends, to wrap up this initial impressions post, let me share with you the complete and detailed technical specifications of O+ Fab Go. Stay tuned for my full review with benchmark tests, sample camera shots, and videos.